Welcome to Radio Ecoshock. It’s summer: the time on the new planet Earth for more high temperature records in the Northern Hemisphere. Others nearly drown in global wetting. We are all at the mercy of the great stalled waves of the Jet Stream my friends. The new normal is there is no normal. The high Arctic ice is melting more or less unreported. Canadian cities notice the great clouds of smoke coming from the burning Boreal forests of the north, unquenched, unseen except by satellite. The same in Russia. Deadly super-fires, as predicted on Radio Ecoshock, are already with us, especially in the American West. It’s a perfect time for “The Burning Question. We Can’t Burn Half the World’s Oil, Coal and Gas. 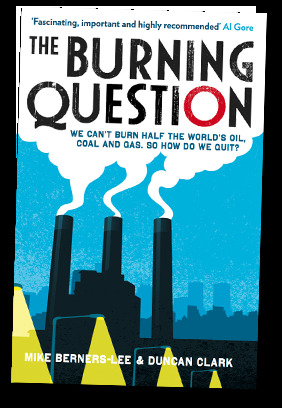 So How Do We Quit?” – a new book by carbon footprint expert, author and Guardian journalist Mike Berners-Lee. His co-author, Duncan Clark, is a consultant editor for the environment section of the UK’s Guardian newspaper, and a visiting researcher at the UCL Energy Institute. The authors conclude the next economic crash may come when the major fossil fuel companies are forced to revalue drastically downward. Why? If the public cannot stomach a climate of extinction, more than half the fossil fuel reserves of the world must stay in the ground. Only the business community, pushed by a worried public, can force politicians into the global agreements needed to ensure our survival. So far, Berners-Lee and Clark say, neither conferences, energy efficiency or alternative energy have had slowed the year-by-year growth of greenhouse gas emissions. We find out more in this feature-length interview of Mike Berners-Lee by UK writer and journalist Greg Moffitt. Greg has written for the BBC and other publications. Now Moffitt has a regular online radio podcast out of the United Kingdom. He calls it “Legalise Freedom”. As I head out to the hills for my summer vacation, let’s listen in as guest host Greg Moffitt turns to the burning question. Mike Berners-Lee discusses The Burning Question, a book co-authored with Duncan Clark. Climate change is the most fascinating scientific, political and social puzzle of our time. Great minds, enthusiastic leaders and green warriors have all tried to tackle the problem, but so far the world’s efforts at reducing global warming have failed. We do our best to save energy and technologies have made burning fuels more efficient, but the simple fact is carbon emissions are still accelerating upwards, following an exponential curve that goes back centuries. Like squeezing a balloon, reductions in one place lead to increases elsewhere. The real barrier to action is that the world has far more fossil fuel in its reserves than it can safely burn – at least twice as much and perhaps ten times as much. These reserves are worth tens of trillions of dollars and solving the problem means persuading the world to abandon them. Find it all at Greg’s site legalise-freedom.com. Be sure to use the British spelling of “legalise” with an “s”. There is a dash between “legalise” and “freedom”. Maybe it is holiday time in the Northern Hemisphere. But the atmosphere keeps on changing, dragging the climate to places humans have never experienced. Join us for the ride at Radio Ecoshock. Feel free to support our program at the web site, ecoshock.org. Thank you for listening – and warming up to the idea of a big, big social change. I’m Alex Smith. This has been Radio Ecoshock.